Two quite different approaches to the topic of Augmented have been realised by these artists. Christina takes direction from her homeland in Central West NSW where family have resided for over five generations. This is where Christina returns to connect with family and the land after her busy life. Christina works in marketing with NAS, is studying in a Masters programme (marketing) and runs her own graphic design business. Christina also works with Ahn Wells at Gallery 139 assisting with marketing and graphic design. 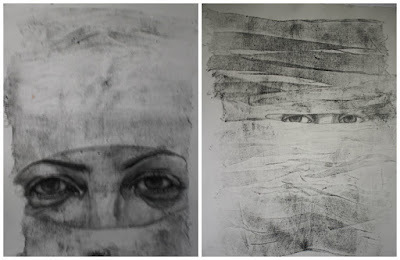 The strongest works for me are the larger charcoal drawings. There is a strength and confidence in how the materials and processes are handled. Augmented explores the way land and nature can change over time with the presence of people. Remnants band together with the natural landscape, becoming inextricably connected. Exploration and documentation of the land represents nostalgia for home; a route to depart from (and return to) while exploring life elsewhere. Louisa Magrics is studying for her Master Philosophy (Fine Art), won the Newcastle Emerging Artist Prize (NEAP) last year, and is also a musician/drummer. Her research is influenced by Frei Otto and the Institute of Lightweight Structures. Some of the works on display are small scale models for larger constructions. Louisa has an installation coming up on 23rd September as part of the 4-year anniversary of Oxford Art Party. 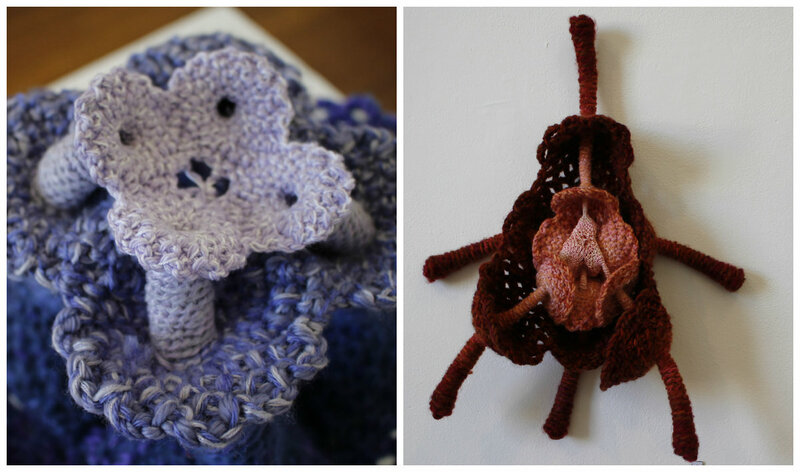 You can join Louisa at Watt Space on 30th September in a crocheting workshop where participants will contribute to the development of a large scale artwork. Louisa talked about her work being ‘form finding’ and realised through a mediated process with digital technology. Research explores crochet as a basis for painterly and sculptural discourse, coupled with an investigation of formal patterns and environmental concerns. The work translates elements of logical, deductive reasoning, but seeks to infer wider meaning conjured by the ambiguous, sometimes bodily, subject matter. Exploring an aesthetic discourse between the organic and the synthetic, Augmented is an investigation of experimentation. Vibrant walls of imagery envelope as you enter Gallery 2. 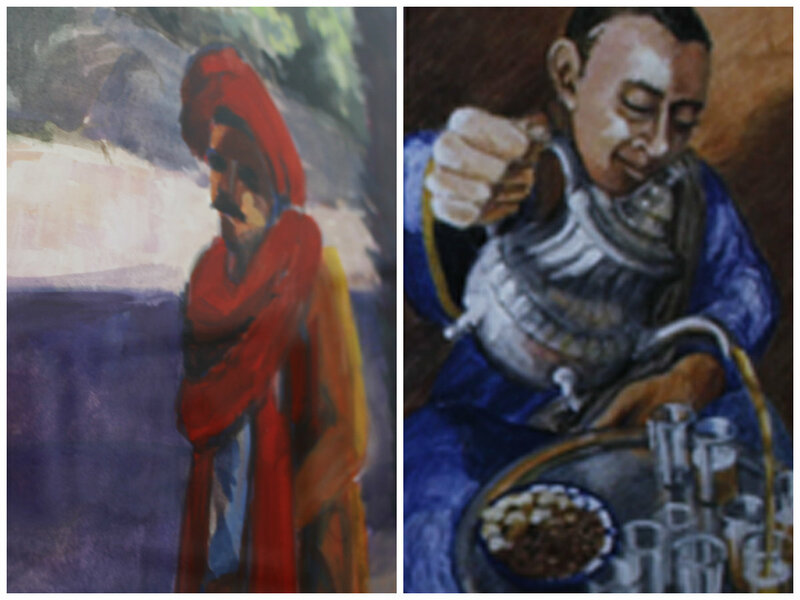 This exhibition is the result of two weeks travelling and working in Morocco during 2015 by three artists. Their tutor was Wendy Sharpe. Olga is a retired art teaching returning to Newcastle after working in Albury-Wodonga over the years. 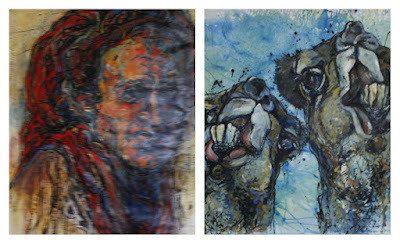 Olga’s focus was drawn to the domestic animals as evident in her work. Melody Jones’ work was highly commended in the recent Newcastle Emerging Artist Prize (NEAP) in the Works on Paper section. Her works in this exhibition depict a variety of subject matter from this travel experience. The strongest of these, are the shrouded faces, which are predominantly mono-prints on Japanese papers. 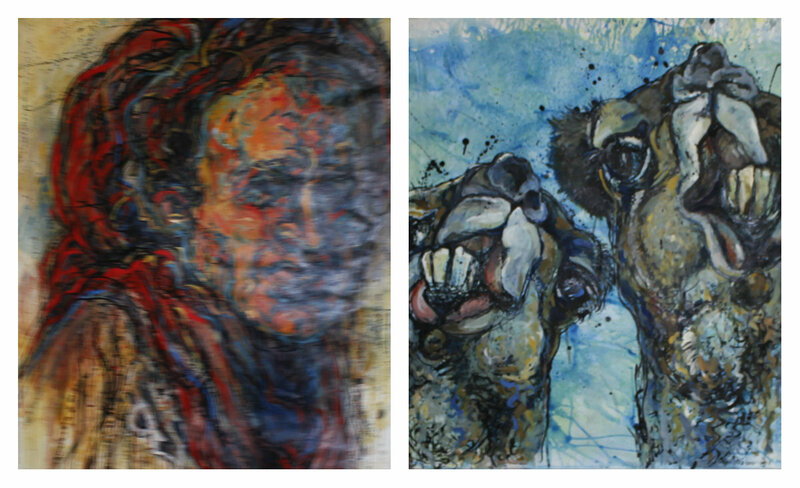 Pamela Ireland is passionate about art and regularly travels to India for inspiration. This is her first overseas workshop. Pamela has rendered her works predominantly in gouache and charcoal and found inspiration amongst the streets, people and landscape. All three women spoke with joy about their experience. As women sometimes walking alone at night, they all felt safe in the main cities of Morocco. The place was alive with colour and traditional culture and dress and this vibrancy of life is reflected in the works. The group are planning on taking the exhibition to other venues.